Since the Balkan countries have begun to split and fight in a never ending ethnic wars, Italy has been seriously involved in trying to cohabit with a danger lying few miles East of her. With the extremely unstable political situation of former Yugoslavia always in mind, Italian Government began thinking about an improvement of the capabilities of the Aeronautica Militare Italiana (AMI) in order to give her the tools to react with effectiveness in case of aggression. 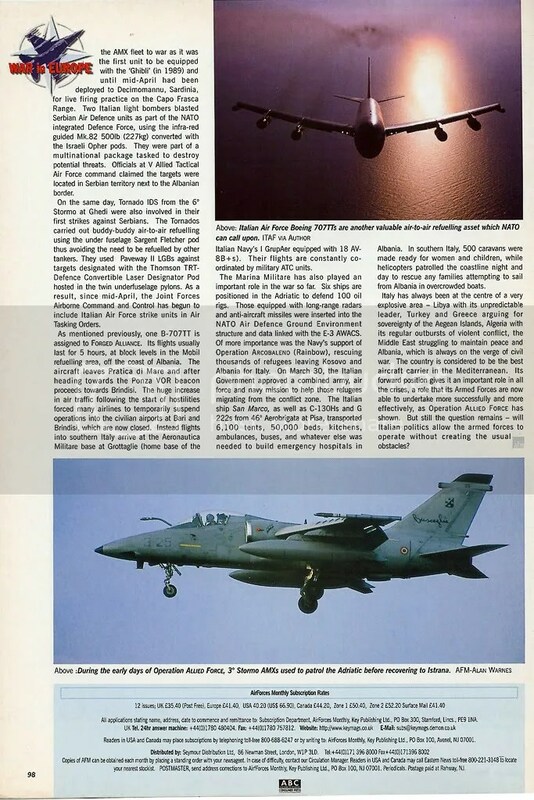 Till the first years of the ‘90s Italian Air Force has had a “Southern profile” . The Warsaw Pact disbandment made her concentrating the forces in its southern outposts as the only threats were thought to be arriving from Libya. The result was the birth of a new squadron and the grouping of aircraft in the airbases of Sigonella, Trapani, Gioia del Colle and Grazzanise with also a monthly rotation of Gruppi that deployed southbound from the bases on the North of the country . The Deny Flight, Deliberate Force, Decisive Endeavour, Joint Endeavour and finally Deliberate Force showed that the actual “enemy” was not off Sicily but on the other side of the Adriatic, spread along 800 Km of coasts, 100 Km of sea away, well defended with Russian weaponry, with modern bombers and equipment. This was obviously the worst neighbor to deal with and, as happened in the first years of the ‘80s, the Italian structure played another migration in order to protect the country from the new potential threat. As tension in the Balkans grew, public opinion realized that the F-104, the backbone of all the Air Defence, was too obsolete to protect the peninsula and as a consequence the AMI leased from the RAF 24 Tornado ADV, “gap filler” between F-104 and EF-2000. 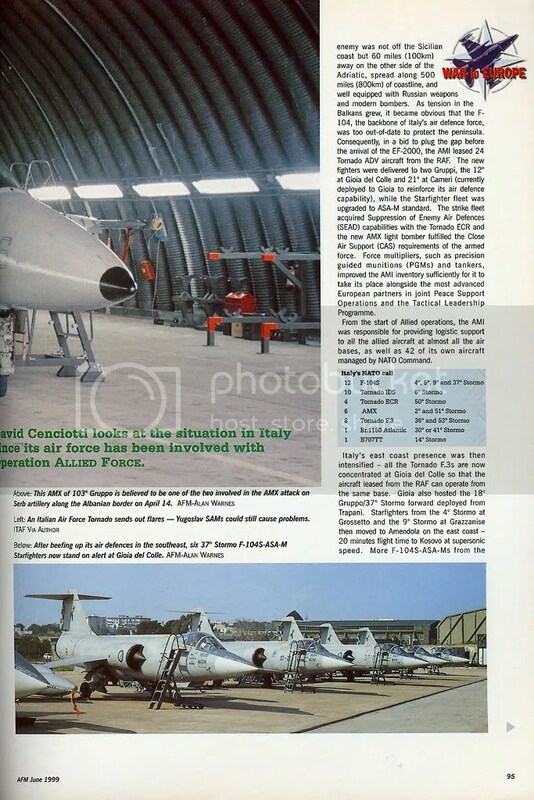 The new fighters were delivered to two Gruppi, the 12th at Gioia del Colle and 21st at Cameri (now joining the 36th Stormo at Gioia) while the Starfighter fleet was upgraded to the ASA-M version. The strike fleet acquired SEAD (Suppression of Enemy Air Defences) capabilities with the Tornado ECR and the new AMX light bomber fulfilled the CAS (Close Air Support) requirements of the armed force. Forces multipliers like Precision Guided Munitions (PGM) and tankers improved the AMI inventory and let her participate with advanced equipment joint Peace Support Operations and enter the Tactical Leadership Programme together with the most advanced European partners. With war in the neighborhood East coast presence was strengthened. All the Tornado F3s were concentrated at Gioia del Colle so all the aircraft leased from the British operated from the same base. Gioia hosted also the 18th Gruppo deployed in forward position from Trapani. Starfighters from 4th Stormo at Grosseto and 9th Stormo at Grazzanise also moved to Amendola on the Eastern coast, 20 minutes flightime to Kosovo, a pair at supersonic speed. More F-104ASA-M coming from disbanded 22nd Gruppo joined the 5th Stormo and its 23rd Gruppo at Cervia always on the Adriatic coast. The Tornado IDS and ECR fleet, involved since 1995 in the monitoring flights above Adriatic sea under NATO flag for Sharp Guard, Determined Force, Decisive Endeavour, Joint Endeavour and Deliberate Force, thanks to their endurance and to their air to air refueling capabilities kept operating from their homebases. Supporting flight were conducted by Br.1150 from 30th and 41st Stormo, within the Operation Eagle Eye, and by 14th Stormo B707TT tankers. With a Communist Prime Minister claiming its faith in NATO from a side but also representing a majority at the Government, with the stronger anti-American left party supporting it on the other, the Italian Armed Forces involvement in the air strikes was quite contradictory from the beginning. This was partly caused by the recent acquittal of Capt Ashby that caused strong reactions in Italy with members of the Parliament claiming for an immediate leaving of the North Atlantic alliance and the expulsion of the allied countries from national bases. Only 39% of the Italians were willing to take part to the raids. The Parliament gave initially the ItAF the clearance to join the Deliberate Force only for defensive tasks without any participation by Italian military in direct operations. 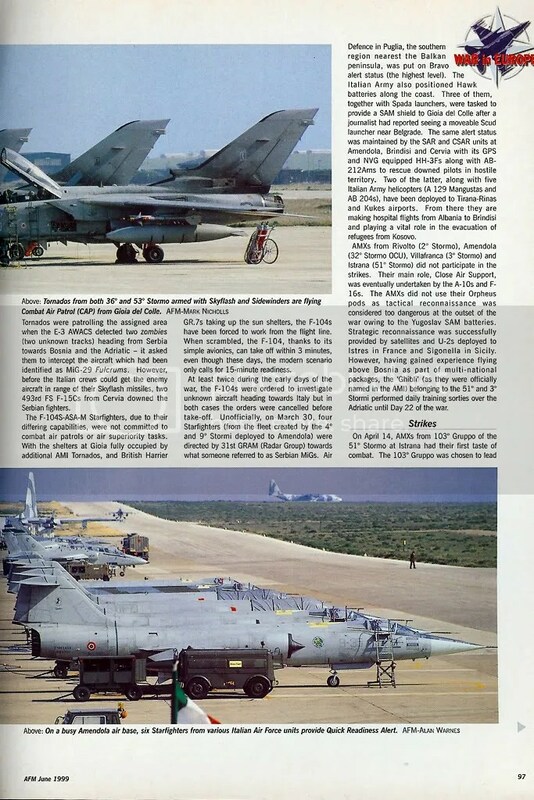 Though initial NATO plans foresaw only a secondary role for Italian jets and pilots, Defence Minister, Mr. Scognamiglio, claimed they would fulfill whatever mission assigned by Gen Clark even if that meant joining the raids. Further, 3500 Italian soldiers in Macedonia must be protected by national assets. On Saturday March 27th night the Italian ECRs from 155th Gruppo ETS (ElecTronic Squadron) escorting the GAF Tornados from AG-51, both operating from Piacenza, fired two AGM-88 HARM and blasted two Serbian SAM batteries that had acquired the package with their radars. As a consequence, Communists strongly attacked the Minister because, in their opinion, the action was a clear violation of a binding resolution passed by Parliament the week before and the first effect was a rift in the majority supporting the Government. Mr. Scognamiglio didn’t reject the speculations that similar actions were still being performed by Italian jets thus confirming the change in the nature of the Italian participation in the operations but at the same time attempted to maintain a purely defensive military posture in the operation claiming Tornados were involved in an “integrated air defence” keeping with the position taken by the Parliament. Prime Minister D’Alema achieved to keep his cabinet together after the Communist partners threatened the withdrawal of their ministers from it but political tension and anti-American sentiment were rising within the governing majority. Fortunately realizing that the survival of the Government was fundamental for the country where the 85% of the war sorties took off, while a war was in progress and while Russian warships were heading for the Adriatic sea, he was able to placate the left asking for new diplomatic negotiations for Kosovo. But he kept supporting NATO strikes if Milosevic wouldn’t halt genocide in the struggling area. So the 155th kept flying its daily sorties each 4-5 hours long. They were loaded with two BOZ-107 Philips pods, two underwing fuel tanks and two HARMs. More than once, plane spotters witnessed the “Panthers” had landed back in the dark of the night without the missiles they had at the departure. The Defence fleet didn’t suffer of such political struggles. Their role was to defend the country. The Tornado F3s from Gioia performed at least 2 daily sorties. Each sortie involved 2 or 4 aircraft that took off always before each strike with a pair kept in alert-15 status with crews sleeping in the shelters and ready to take off within 15 minutes from the “Scramble” order. Armed with 4 Skyflash. 4 AIM-9L Sidewinder missiles and 2 underwing fuel tanks they patrolled the sky orbiting in racetracks that were initially located off the Italian coasts then repositioned next to the AIR PIC (Air Picture), above Bosnia. During each flight they were refueled by Italian B-707TTs from Pratica di Mare or by allied tankers. In the second day of the War two Tornados were patrolling the assigned area when the E-3 AWACS detected two “zombies” (two unknown tracks) heading from Serbia inbound Bosnia and Adriatic and requested them to head against the aircraft that had been identified as Mig-29 Fulcrums. Before the Italian crews had the enemies in range for their Skyflah missiles two 493rd FS F-15C from Cervia, nearer to the enemies, downed the Serbian fighters. With their different characteristics the F-104ASA-M were not committed with CAPs or air superiority tasks. At Gioia, filled by ItAF Tornados and British Harrier GR.7, the F-104s were not recovered inside hardened shelters but aligned on the flight line. Differing from the 12th and 21st Gruppi and their Tornados, the 18th still equipped with the old Starfighters came back again to the ready-in-five status a peculiarity of the ‘80s. When scrambled, the F104, thanks to its simple avionics, it’s still capable of take off within 3 minutes from the order, even though during the last years, from the end of the Soviet Union, the modern scenario has been permitting interceptors to keep only a 15 minutes readiness. At least twice in the first days of War the F-104 were ordered to take off for unknown aircraft heading towards Italy but in both cases the order was cancelled before the aircraft could take off. 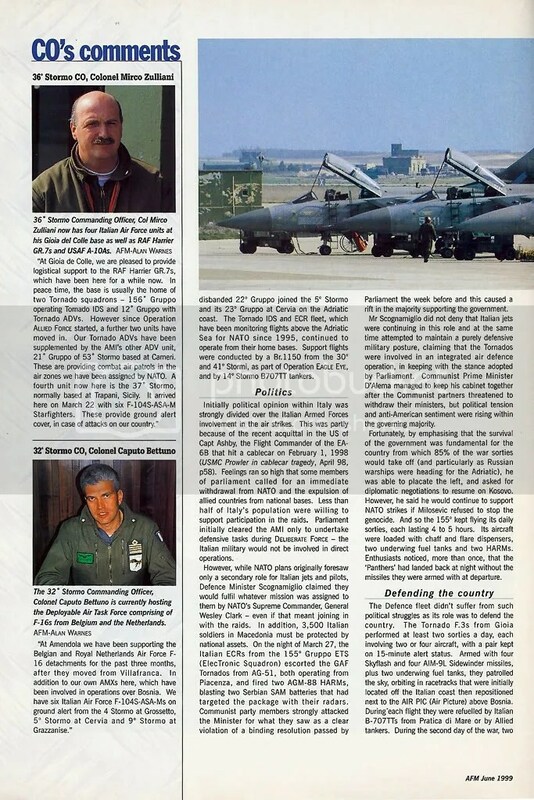 Unconfirmed rumours say on March 30th four Starfighters from the nucleus composed by 4th and 9th Stormo deployed to Amendola were headed by 31st GRAM (Radar Group) towards what someone referred to as Serbian Migs. The standard configuration saw Italian Starfighters armed with two tip tanks a Alenia Aspide under the starboard wing and an AIM-9L Sidewinder under the port one. Air Defence in Puglia, the Southern region more near to the Balkan peninsula, was at the highest level with bases at Bravo alert status. Along the coast of the region Italian Army positioned Hawk batteries. Three of them, together with Spada launchers were tasked to provide a SAM shield to Gioia del Colle after a journalist had witnessed moveable Scud launcher near Belgrade. Same alert status was kept by the SAR and Combat-SAR units. In particular the ItAF had 24 hours a day HH-3F Bravo with GPS and NVGs and AB-212Ams were ready for the take off at Brindisi, Cervia and Amendola to rescue downed pilots in hostile territory. A couple of them, along with Italian Army contingent consisting of 5 helos A-129 and AB-204, were deployed to Tirana-Rinas and Kukes airports and flew hospital flights from Albania to Brindisi and played a vital role to help the Kosova refugees subject to ethnic cleansing. AMXs from Rivolto (2nd Stormo), Amendola (32nd Stormo OCU), Villafranca (3rd Stormo) and Istrana (51st Stormo) didn’t participate in the strikes at the beginning. Their main role, Close Air Support, was to be eventually played by the A-10s and F-16s. They didn’t use their Orpheus pods cause tactical reconnaissance was considered too dangerous at the beginning of the War with all the SAM batteries believed to be in Serbian hands and considering that strategic and tactical recce was successfully provided by satellites, German UAVs and U-2s deployed to both Istres, France, and Sigonella, Sicily as part of the 16th Air Expedictionary Wing. However since their great experience in flying above Bosnia as part of multinational packages, “Ghibli”, as they were officially named in the AMI, belonging to the 51st and 3rd Stormi performed daily training sorties over the Adriatic until the Day 22 of the war. On April 14th morning the AMX from 103rd Gruppo of the 51st Stormo at Istrana had their combat first in a war. The 103rd Gruppo was choosen to lead the AMX fleet to war as being the first unit to be equipped with the Ghibli in 1989 and also since the Gruppo had been deployed to Decimomannu, Sardinia, to play live firing activity in the Capo Frasca Range, until mid April. 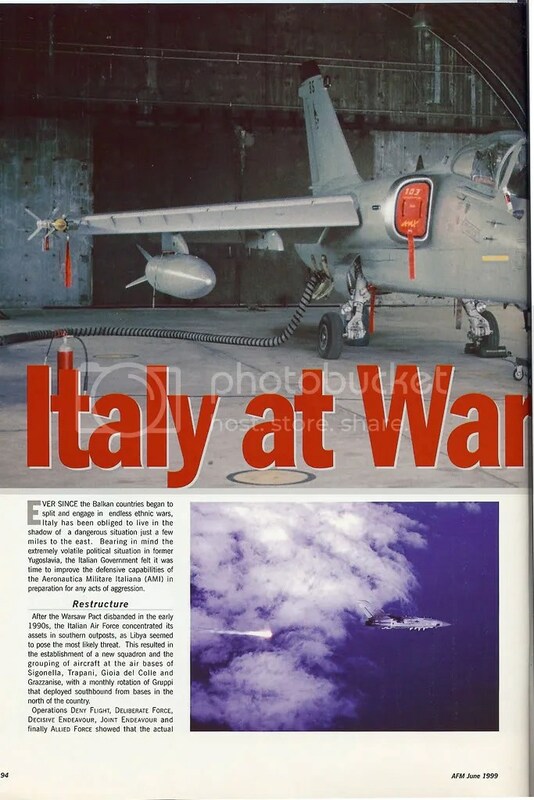 Two Italian light bombers blasted Serbian Air Defence units, as part of the NATO integrated Defence, using the Infra Red guided Mk 82 227Kg (500 lb) converted with the Israeli Opher pods . They were part of a multinational package whose mission was to destroy allied forces’ potential threats. Officials at V ATAF command claimed the targets were located in Serbian territory next to the Albanian border. The AMXs used their PGMs during their 4 hours long sortie but rumors in Italy says they used even the 500 lbs Mk 83 bombs against armoured units. During the same day even the Tornado IDS from the 6th Stormo at Ghedi were involved in their first strikes against Serbians. The Italian raids were all located next the threatened Albanian territory to show Milosevic that the alliance won’t accept him to attack or invade the neighbour country. The Tornados performed the “buddy-buddy” procedure for the air to air refueling using the under fuselage Sargent Fletcher pod thus being able to strike without the need to be refueled by other tankers. They used Paveway II LGBs against targets designated with the Thomson TRT-Defence Convertible Laser Designator Pod (CLDP) hosted in the twin underfuselage pylons. So, since Mid April, the JFACC has started to put also the strike units of the Italian Aif Force in the Air Tasking Orders. As said, one B-707TT of the four that equip the 14th Stormo, was assigned to the Deliberate Force. It flew a single night missions per day refueling Italian and foreign assets with its starboard and port hoses. Its flight plan made the “Penny” (radio callsign of the tanker) orbiting for at least 5 hours at block levels in the refueling area called “Mobil” off the Albanian coasts. The aircraft always took off from Pratica di Mare and after heading towards the Ponza VOR proceeded towards Brindisi and then “feet wet” to the operative racetrack. The Allied Force was the first war to be fought by the Italian Tanker Force. The big increase in the air traffic flow following the beginning of the hostilities caused many airways to be temporary suspended and the civilian airports of Bari and Brindisi to be closed. In order to provide a call for people going towards Southern Italy, the Aeronautica Militare opened the military airport of Grottaglie, that is also homebase of the I GrupAer of the Italian Navy with 18 AV-8B+, to the Alitalia, Air One and British Airways companies. Their flights had to be constantly coordinated with military ATC units and also after the Bari airport was opened again flights were allowed with only two hours separation one another. The Marina Militare played an important role in the war. Six ships were positioned in the Adriatic in order to defend the above 100 oil rigs in the sea. Those equipped with long range radars and anti-aircraft missiles were inserted in the NADGE structure and data linked with the E-3 AWACS. More important was her support to the Operazione Arcobaleno (Rainbow), for the rescue and the hosting of the hundred thousands of refugees that escaped from Kosovo and Albania towards Italy. With a great experience in facing such crisis, Italian Government approved on March 30th a joint Army, Air Force Navy mission to help the Kosovo population migrating from the fighting area. The Italian ship San Marco and C-130Hs and G-222s from 46th A/B at Pisa carried 6,100 tents, 50,000 beds, kitchens, ambulances, buses, and whatever was needed to build emergency hospitals in Albania. In Southern Italy 500 caravans were readied to host women and children while helos patrolled night and day the coastline to be ready to rescue the families that attempted to ferry from Albania on overcrowded boats. A big trouble Italian politics and Air Force staff were compelled to face during the war was the lack of experienced pilots. In the last years the number of pilots who left the Air Force to better paid job within civilian airlines made the phenomenon looking like a mass exodus. The ItAF seems to loose its skilled personnel more than in the past and this caused operative units to have less combat ready pilots than efficient fighters. In order to face this hemorrhage the Parliament passed a bill that foresee an increase in the income of pilots of 30 million Lire (£10,000) per year for officers who decide to keep flying within the Aeronautica Militare. Anyway among the major Air Forces the Italian pilots keep to be the ones with the lowest income. Concluding, Italy has always been at the centre of a very explosive area. Libya with its unforeseeable leader, Turkey and Greece struggling for the sovereignty on the Aegean islands, Algeria with its wild violence, Middle East in a difficult peace status and Albania always on the edge of civil war. She is considered the best “aircraft carrier” of the Mediterranean. Her forward position can make her playing an important role in all the crisis, a role that her Armed Forces are now able to play with success but also with great efforts as Allied Operation showed. The point is: are Italian politics able to let them operate without creating the usual obstacles? At the time of writing, April 21th, the Aeronautica Militare Italiana has contributed to the Allied Force with 250 war sorties, 42 aircraft, 14 airbases hosting 450 allied aircraft. The Marina Militare keeps constantly 6 ships in the Adriatic while the Esercito Italiano has 6,000 men (with the possibility to increase to 7,500) an aroured Brigade Taurinense and 5 helocopters.